Dog beds at 10% discount on marked price across our whole range, cat beds too. 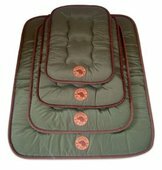 We carry quite a range of quality dog beds and cat beds in store. For the rest of this month we are offering 10% OFF all dog beds and cat beds. Dog beds and cat beds can be purchased in store, or on line at our web store. FREE local delivery is available on ALL discounted dog beds and cat beds.